On Thursday, during my time at Eastern Illinois University, I sat in on Tim Engles's "Multicultural American Literatures" class. Engles was covering Richard Wright's Savage Holiday (1954) -- a work that is less well-known among the writer's more famous books like Native Son (1940) and Black Boy (1945). 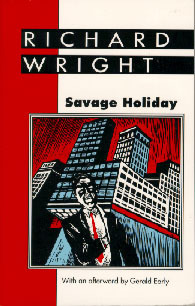 Listening as Engles facilitated a discussion of Savage Holiday with his students took me back more than 20 years ago when I enrolled in a Richard Wright course. In that undergrad class, we read Lawd Today!, Black Power, The Color Curtain, Pagan Spain, Eight Men, The Outsider. and Savage Holiday. (We were expected to have already read Native Son, Black Boy, and Uncle Tom's Children prior to taking the course). I went to an HBCU, so the classroom where I covered Savage Holiday contained only black students, while Engles's class contained mostly white students. The main character of Savage Holiday is a white man, which might also explain why the novel has gained far less attention. The class at Eastern on Thursday had me thinking about the different and overlapping responses black students and white students might have to a book with a white protagonist by African American author. I've also been thinking about keywords and concepts in my classes, and Engles's approach caught my attention. He would raise and define different terms as he discussed the novel with the students. At times, he would ask for volunteers to define concepts that emerged. When students mentioned uncommon terms during their own comments, he prompted them to define the term. One student, for instance, mentioned "meta-cognition " as she spoke, and Engles encouraged her to define the term for the class. I'm looking forward to incorporating some of what I learned from the experience of sitting in on Engles's class into my own sessions. Speaking of looking forward, Engles has an article on Wright's Savage Holiday, which will appear in his forthcoming book, White Male Nostalgia in Contemporary North American Literature. Thank you for joining us, Howard! And also for this post -- it's great to hear that you enjoyed the class, and I'm always glad to see new interest in Savage Holiday. I know that the students appreciated the information that you provided about Wright, as well as the revealing and fun activity that you conducted concerning the many different covers of his memoir Black Boy. Your highly informative, engaging and even inspirational campus talk on Coates, Whitehead, and how publishing success often happens these days provoked a lot of positive reactions too.